For galaxy nails day today, I (of course) wanted to do something a little bit outside of the box. I've done galaxy nails pretty recently and was really happy with the outcome, so I thought I'd go in a bit of a different direction this time. I chose to depict the way stars look just as a ship enters hyperspace (in science fiction like Star Wars). It was really quite difficult to do these on such a small scale. To try to make things easier, I would do the lines in white and then go back in with more black to make them straighter, thinner, and cleaner. Still, it's not quite as clean as my perfectionist heart wants. 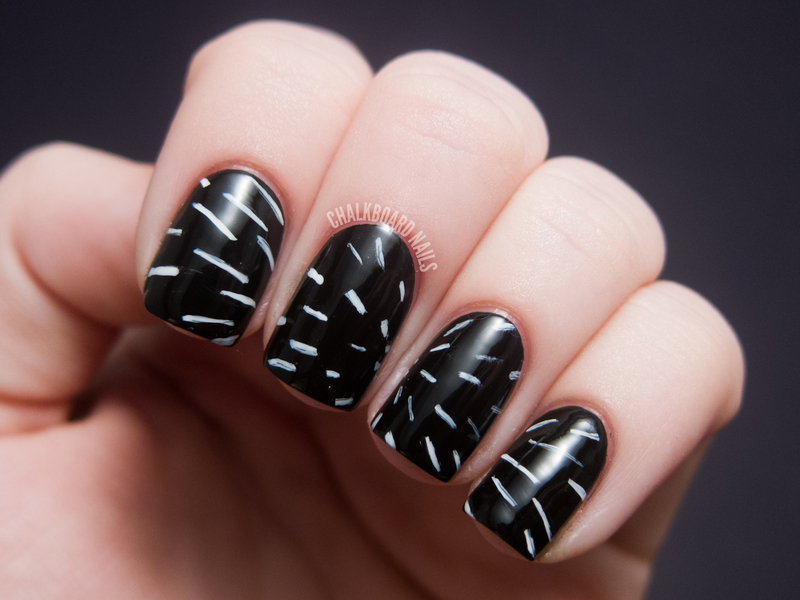 The white used in this look is OPI Alpine Snow and the black is OPI Black Onyx. Last year's galaxy nails were my first attempt at the style. You can also take a look at upcoming challenge prompts here. These are hot Sarah!! So cool! I love that you did a different take on galaxy nails. These remind me to those old windows screensavers, really cool! This is so unique! It makes me think of WARP SPEED! WOAH!!! This is amazing and I totally completely LOOOOOOVE your idea!! It is so awesome!!! This would be even more awesome if you went back over the white stripes with glow in the dark polish! totally agree with the comment above but these look so cool! These are really awesome! I can't believe the way you actually captured movement! you definitely nail thinking outside the box! Brilliant! Hyperspace nails! I love it! I feel like I am in the Millennium Falcon! This is such a fun, unique take on the galaxy nails! Whoa! You've totally got a 3D look going on here. Whoa. Amazing. You are so creative. I love this. WoW! That is fantastic!! I love to see a manicure design that I get just by looking at it without having to read the description of what it's "supposed" to be. I got it right away. It's so simple looking yet so amazing. Well done!